Red Cross provided a tent for the Fusitua family to sleep in after their home was destroyed when Tropical Cyclone Gita hit Tonga. As families across the Pacific begin to clean up after Tropical Cyclone Gita, Red Cross is distributing relief supplies to help affected communities. Gita crossed Samoa as a category two cyclone, causing widespread flooding, before hitting Tonga and Fiji’s southern islands as a category four cyclone this week. Thousands of people are still in evacuation centres after the cyclone destroyed buildings, wiped out crops and damaged vital infrastructure, cutting power, water and communication lines. In Tonga, which felt the full strength of Gita, Red Cross is distributing relief supplies such as shelter kits, tarpaulins, kitchen sets, solar lamps and hygiene kits to help people temporarily repair damaged houses and survive without power and water. 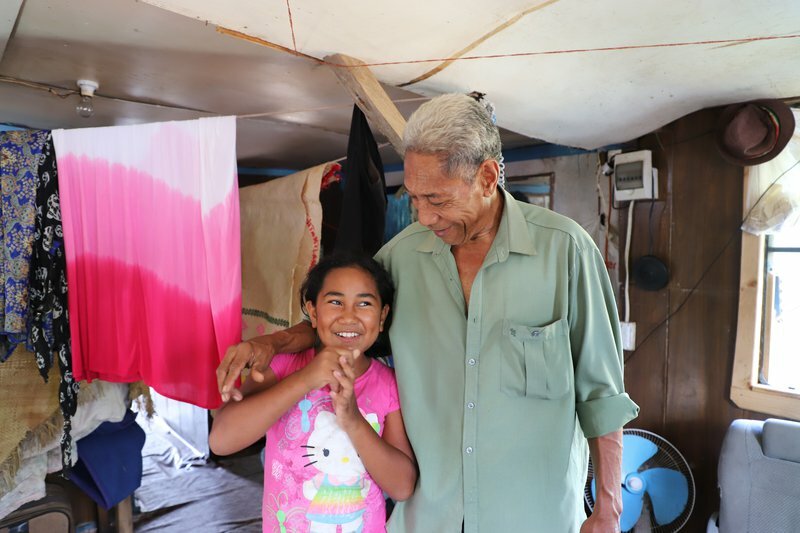 Takivalu Faasee and his daughter are happy to have a dry place to live after Tonga Red Cross provided a tarpaulin for their damaged roof. Takivalu Faasee’s roof was badly damaged when Cyclone Gita passed over Tonga. His family received a tarpaulin from Tonga Red Cross on Wednesday, which means the house is now protected from the rain and sun. It also means Takivalu’s wife and two children have been able to return home from the evacuation centre. “I’m very happy with what we’ve been given because we can move back into the house and be together,” he says. 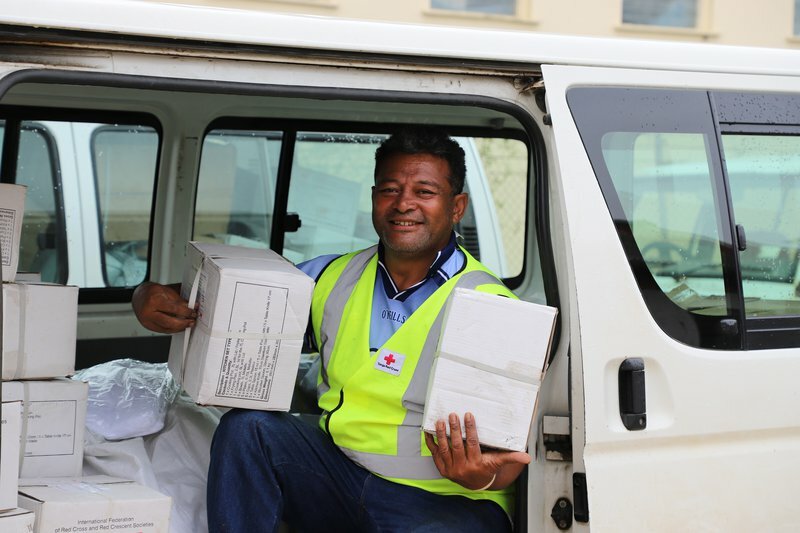 Samoa Red Cross has also been distributing relief supplies to affected communities, while water and relief supplies from Fiji Red Cross are being shipped from Suva to the remote Southern Lau islands, which were also hit by Cyclone Gita. New Zealand Red Cross has been working closely with counterparts in Tonga, Samoa and Fiji. Shortly after the cyclone hit Samoa, New Zealand Red Cross transferred $10,000 from its Pacific Disaster Fund and dispatched 300 tarpaulins to support relief efforts in the country. New Zealand Red Cross has also dispatched thousands of blankets, shelter kits, tarpaulins, mosquito nets and solar lamps to Tonga. Tonga Red Cross staff and volunteers have supplied hundreds of tarps, tents, kitchen sets, and lanterns to people affected by Tropical Cyclone Gita. Pacific leaders are encouraging people who want to help affected communities to donate cash, not goods or food. New Zealand Red Cross Pacific community engagement representative Malia Tua'i says cash is the fastest, most effective way to help. "The need is now, by the time you gather all that food and clothes and whatnot, the disaster will be over. Cash is best." Cyclone Gita is now moving over the Pacific and is expected to hit New Zealand early next week. Red Cross teams will be keeping a close eye on its path during the weekend. The quickest and most effective way to help communities affected by Tropical Cyclone Gita is to donate to Red Cross' Pacific Disaster Fund. You can also text RED CROSS to 4644 to make an automatic $3 donation. Why does Red Cross encourage cash, not goods? We know Kiwis are always keen to help after a cyclone. To make a lasting difference in communities, we ask people to donate money instead of goods. The Tongan National Emergency Management Office has strongly stated that it will not be accepting unrequested goods and food. In addition, years of experience have taught us what emergency aid is needed during a disaster. We store large quantities of these items in warehouses throughout the world, including across the Pacific, which are ready to distribute within hours of a disaster. In fact, that is what we are doing right now to support Samoa and Tonga Red Cross response efforts. Sending unrequested food or goods takes time, it clogs up ports and logistics chains, and create delays. Cash, on the other hand, is easier to collect, transfer, distribute and account for, while also boosting the local economy. Quite simply, communities recover faster when we source goods locally and use internationally recognised relief items – your cash donation will help that happen. The Ministry of Foreign Affairs and Trade has put together useful information about donating during a disaster and how best to help. You can read it here.